Maniwa Sherab Gyaltsen Rinpoche, a highly respected lama of the Kagyu lineage. “Maniwa” is a title given to masters of the Chenrezi practice who have accomplished at least a billion Om Mani Peme Hung mantras. Since completing the 3-year retreat under Bokar Rinpoche, Sherab Gyaltsen Rinpoche has been supporting the activity of the Kagyu lineage through his tireless commitment to practicing, giving transmission and guiding disciples. Among his many activities, Rinpoche is retreat master of the 3-year retreat center in Pharping. He built and oversees a monastery of a hundred nuns west of Kathmandu, and his plans to build a monks’ monastery east of the capital is developing. Several times a year Rinpoche leads thousands of practitioners in the practices of Nyoung-ne and Chenrezi at his Nyeshang Monastery in Swayambhunath. Over twenty billion Chenrezi mantras have been accumulated over the past quarter century. 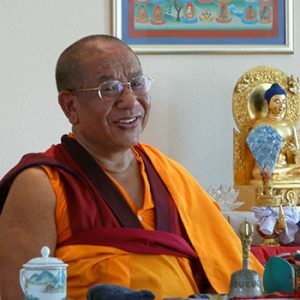 Rinpoche’s teaching style is deep, direct and accessible. His teachings, peppered with practical advice, stories and warm humor, leave a lasting impression on all who are fortunate enough to hear them.